The Grammy Award for Best Latin Pop Album is an award presented at the Grammy Awards, a ceremony that was established in 1958 and originally called the Gramophone Awards, to recording artists for releasing albums in the Latin pop genre. Honors in several categories are presented at the ceremony annually by the National Academy of Recording Arts and Sciences of the United States to "honor artistic achievement, technical proficiency and overall excellence in the recording industry, without regard to album sales or chart position". Throughout its history, this award has had minor name changes: "Best Latin Pop Performance" (1984—1991, 1995—2000) and "Best Latin Pop Album" (1992—1994, 2001 to date). In 2012 the award was not presented due to a major overhaul of Grammy categories. That year recordings in this category were shifted to the newly formed "Best Latin Pop, Rock or Urban Album". However, later that year, the Board of Trustees announced that it would be bringing back the category for the 55th Grammy Awards in 2013 with the following description: "for albums containing at least 51 percent playing time of new vocal or instrumental Latin pop recordings". From 1984 to 1991, the category allowed single tracks or albums, and as of 1992 only includes albums. Beginning in 1998, members of the Latin Academy of Recording Arts & Sciences (LARAS) are eligible to vote in the Latin field of the Grammy Award categories. Puerto Rican singer José Feliciano was the first awarded in the category for his album Me Enamoré (1984), and became the biggest winner with four accolades. 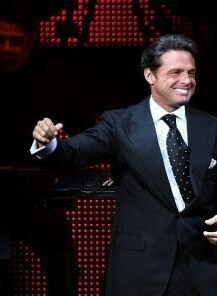 The most nominated performer is Mexican singer Luis Miguel with twelve nominations that resulted in three wins, including his consecutive awards for Aries (1994) and Segundo Romance (1995). In 1998, Spanish artists Enrique Iglesias and Julio Iglesias, father and son, where nominated against each other for their albums Vivir and Tango, respectively, losing both to Miguel's Romances. Guatemalan singer-songwriter Ricardo Arjona and Mexican musician Julieta Venegas tied in 2007 for their albums Adentro and Limón y Sal, respectively. Panamanian artist Rubén Blades has received the award twice, in 2000 and 2015, and also has been recognized in other fields, with winning albums for Tropical Latin Album and World Music Album. Laura Pausini became the first Italian female artist to win a Grammy Award with the album Escucha in 2006. No Es lo Mismo by Spanish singer Alejandro Sanz, La Vida... Es un Ratico and MTV Unplugged by Colombian artist Juanes, and Vida by Puerto Rican singer-songwriter Draco Rosa won the Grammy Award for Best Latin Pop Album and also received the Latin Grammy Award for Album of the Year. Shakira became the first female performer to receive the honor twice, with her winning albums MTV Unplugged (2001) and El Dorado (2018). As of 2018, Mexican singer José José is the most nominated performer without a win with six unsuccessful nominations. Puerto Rican singer José Feliciano, the most awarded performer with four wins. Cuban-American singer Jon Secada, winner in 1993 and 1996. Two-time winner, Puerto Rican artist Ricky Martin, winner in 1999 and 2016. Spanish performer Plácido Domingo, winner in 1985. Brazilian singer-songwriter Roberto Carlos, winner in 1989. American artist Vikki Carr, winner in 1992. Plácido Domingo – "Bésame Mucho"
José Feliciano and José José – "Por Ella"
José Feliciano "Le Lo Lai"
Pandora – "¿Cómo Te Va Mi Amor?" María Conchita Alonso – "Otra Mentira Más"
José Luis Rodríguez – "Baila Mi Rumba"
José Feliciano "¿Por Qué Te Tengo Que Olvidar?" Isabel Pantoja – "Se Me Enamora el Alma"
Jesse & Joy – ¿Con Quién Se Queda El Perro? ^[II] Award was merged with the Best Latin Rock, Urban or Alternative Album into the newly created Grammy Award for Best Latin Pop, Rock or Urban Album. A : Adam Blackburn, Eric Schilling, Marcelo Añez and Sebastián Krys, engineers; Tim Mitchell, producer. B : Joe Reyes, Michael Morales and Ronald Morales, engineers and producers. D : Pepo Sherman and Rafa Sardina, engineers; Mick Guzauski, engineer/mixer; Lulo Pérez, producer. E : Gustavo "Pichon" Dal Pont and Sebastián Krys, engineers/mixers; Estéfano, producer. H : Cesar Sogbe, Coti Sorokin, Demian Nava, Juan Blas Caballero, Matías Sorokin and Sebastián Schon, engineers/mixers; Cachorro López, producer. I : Carlos Alvarez, Lulo Perez, Pepo Sherman, Rafa Sardina and Thom Russo, engineers; Lulo Pérez, producer. J : Gustavo Santaolalla, producer. L : Bob Clearmountain, engineer/mixer; Tomás Torres, producer. M : Gustavo Borner, engineer/mixer; Juan Luis Guerra, producer. N : Seth Horan Atkins, Benny Faccone and Sadaharu Yagi, engineers/mixers. O : Chris Sulit, engineer/mixer; Carlos Franzetti, producer. P : Julio Reyes Copello, producer; Reyes, Javier Garza, Ricardo López Laliinde, and Carlos Fernando Lopez, engineers. Q : Carlos Hernández Carbonell and Dave Clauss, engineers/mixers. ^ "Grammy Awards at a Glance". Los Angeles Times. Tribune Publishing. Retrieved April 24, 2010. ^ "Overview". National Academy of Recording Arts and Sciences. Retrieved July 23, 2015. ^ "Explanation for category restructuring". grammy.org. National Academy of Recording Arts and Sciences. Retrieved July 20, 2015. ^ a b "The Recording Academy Announces Board Of Trustees Meeting Results". National Academy of Recording Arts and Sciences. June 8, 2012. Retrieved June 11, 2012. ^ a b Cromelin, Richard (January 11, 1991). "Grammys--Round 1 : Pop music: Phil Collins' 8 nominations lead the pack and Quincy Jones sets a record with his 74th nod. The winners will be revealed on Feb. 20". Los Angeles Times. Tribune Publishing. p. 3. Retrieved April 8, 2015. ^ Lannert, John (August 29, 1998). "Mauricio Abaroa". 110 (35). Nielsen Business Media, Inc.: LMQ-4. ISSN 0006-2510. Retrieved October 15, 2016. ^ Picolli, Sean (January 7, 1998). "Are Top-selling Sons Ready To Hop On Pops?". Sun-Sentinel. Tribune Publishing. Retrieved July 20, 2015. ^ Ratner-Arias, Sigal (February 11, 1997). "Ausente, Maná se lleva el Grammy; empatan Arjona y Venegas". Terra Networks (in Spanish). Telefónica. Retrieved July 20, 2015. ^ Chávez Candelaria, Cordelia (2004). Blades, Rubén. Encyclopedia of Latino Popular Culture. 1. Greenwood Press. p. 78. ISBN 9780313332104. Retrieved July 20, 2015. ^ Zonkel, Phillip (October 16, 2014). "Latin Grammy Award-winning singer Laura Pausini to play L.A.'s Greek Theatre". Los Angeles Daily News. MediaNews Group. Retrieved July 20, 2015. ^ "5th Annual Latin Grammy Awards Winners". Billboard. Nielsen N.V. September 1, 2004. Retrieved July 21, 2015. ^ Ayala, Ben-Yehuda (November 14, 2008). "Juanes Wins Big At Latin Grammy Awards". Billboard. Nielsen N.V. Retrieved July 21, 2015. ^ Pareles, Jon (November 16, 2012). "For Latin Grammy Awards, a Giddy and Gaudy Whirl of Styles". The New York Times. The New York Times Company. Retrieved July 21, 2015. ^ Khoshaba, Christy (November 21, 2013). "Latin Grammys 2013: The complete list of winners and nominees". Los Angeles Times. Tribune Publishing. Retrieved July 21, 2015. ^ Marti, Diana (January 28, 2018). "Shakira Makes History With 2018 Grammy Win for Best Latin Pop Album". E! Online (in Spanish). E! Entertainment Television. Retrieved January 29, 2018. ^ a b c d e f g h i j k l m n o p q r s t u v w x y z aa ab ac ad ae "Past Winners Search". National Academy of Recording Arts and Sciences. Retrieved July 21, 2015. ^ "Complete List of the Nominees for 26th Annual Grammy Music Awards". Schenectady Gazette. The Daily Gazette Company. January 9, 1984. p. 49. Retrieved May 14, 2014. ^ "Academy of Recording Arts & Sciences nominees for Grammy..." United Press International. January 10, 1985. Retrieved July 17, 2015. ^ Fernández, Enrique (January 25, 1986). "Latin Notas". Billboard. 96 (4): 53. Retrieved November 26, 2012. ^ Hunt, Dennis (January 9, 1987). "Grammy Nominations: Highs and Lows: Winwood, Gabriel and Simon Garner Most Nominations". Los Angeles Times. Tribune Publishing. Retrieved November 26, 2012. ^ "Here are the nominees for the 30th annual Grammy..." United Press International. January 14, 1988. Retrieved July 17, 2015. ^ Hunt, Dennis (January 13, 1989). "Chapman, McFerrin Lead Grammy Race : Baker, Sting, Michael, Winwood Also Capture Multiple Nominations". Los Angeles Times. Tribune Publishing. p. 3. Retrieved July 17, 2015. ^ "Here's list of nominees from all 77 categories". Deseret News. Salt Lake City, Utah: Deseret News Publishing Company. January 12, 1990. p. 32. Retrieved February 1, 2019. ^ "The Grammy Nominations". Los Angeles Times. Tribune Publishing. January 9, 1992. p. 3. Retrieved July 17, 2015. ^ Kellner, Elena (February 11, 1993). "Latin Beat to Accent Grammy Awards". Los Angeles Times. Tribune Publishing. Retrieved July 17, 2015. ^ "General Categories". Los Angeles Times. Tribune Publishing. January 7, 1994. p. 3. Retrieved July 20, 2015. ^ Lannert, John (January 21, 1995). "Artists & Music – Latin Notes". Billboard. 107 (3): 36. Retrieved July 20, 2015. ^ "38th Annual Grammy Awards: Final Nominations". Billboard. 108 (2): 74. January 13, 1996. Retrieved July 17, 2015. ^ "The Complete List of Nominees". Los Angeles Times. Tribune Publishing. January 8, 1997. p. 3. Retrieved March 5, 2015. ^ "1997 Grammy Nominees". Orlando Sentinel. Tribune Publishing. January 9, 1998. p. 3. Retrieved July 17, 2015. ^ "Academy's Complete List of Nominees". Los Angeles Times. Tribune Publishing. January 6, 1999. p. 3. Retrieved July 17, 2015. ^ "A Complete List of the Nominees". Los Angeles Times. Tribune Publishing. January 5, 2000. p. 4. Retrieved July 17, 2015. ^ Boucher, Geoff (January 4, 2001). "Grammys Cast a Wider Net Than Usual". Los Angeles Times. Tribune Publishing. p. 4. Retrieved July 17, 2015. ^ "List of Nominees". Los Angeles Times. Tribune Publishing. January 5, 2002. p. 3. Retrieved July 17, 2015. ^ "Grammy Nominations: Complete List". Fox News Channel. January 3, 2003. Archived from the original on 2012-10-22. Retrieved November 9, 2010. ^ "The complete list of nominees". Los Angeles Times. Tribune Publishing. December 5, 2003. p. 4. Retrieved July 17, 2015. ^ Gallo, Phil (December 7, 2004). "Grammy gets its groove on". Variety. Penske Business Media. Retrieved July 17, 2015. ^ Welsh, James (December 8, 2005). "Grammys: Full nominee list". Digital Spy. Hearst Corporation. Retrieved July 17, 2015. ^ "2006 nominees". Los Angeles Times. Tribune Publishing. December 8, 2006. p. 5. Retrieved July 17, 2015. ^ "The Complete List of Grammy Nominees". The New York Times. The New York Times Company. December 6, 2007. p. 3. Retrieved July 17, 2015. ^ "Grammy Scorecard". Los Angeles Times. Tribune Publishing. December 3, 2008. Retrieved July 20, 2015. ^ "Grammy 2010 Winners List". Billboard. Prometheus Global Media. January 31, 2010. Retrieved July 20, 2015. ^ "Grammy Awards 2011: Winners and nominees for 53rd Grammy Awards". Los Angeles Times. Tribune Publishing. 2011. Retrieved July 20, 2015. ^ "Grammy Awards 2012: Winners and nominees list". Los Angeles Times. Tribune Publishing. 2012. Retrieved July 20, 2015. ^ "Grammys 2013: Complete list of nominees and winners". Los Angeles Times. Tribune Publishing. February 10, 2013. Retrieved July 20, 2015. ^ "Grammy Awards 2014: Full Nominations List". Billboard. Prometheus Global Media. December 6, 2013. Retrieved July 20, 2015. ^ "Grammys 2015 Preview: The Lowdown on the Best Latin Pop Album and Best Latin Rock, Urban, or Alternative Album Nominees". Billboard. Prometheus Global Media. December 30, 2014. Retrieved July 20, 2015. ^ "2016 Grammy Awards: Complete list of nominees". Los Angeles Times. Tribune Publishing. December 7, 2015. Retrieved December 7, 2015. ^ Figueroa, Karla (February 15, 2016). "Grammy Awards 2016: Ricky Martin gana Mejor álbum pop latino". Variety Latino (in Spanish). Penske Media Corporation. Retrieved April 11, 2016. ^ Unterberger, Andrew (December 6, 2016). "Here Is the Complete List of Nominees for the 2017 Grammys". Billboard. Prometheus Global Media. Retrieved December 8, 2016. ^ Lynch, Joe (November 28, 2017). "Grammys 2018: See the Complete List of Nominees". Billboard. Eldridge Industries. Retrieved November 28, 2017. ^ Lynch, Joe (December 7, 2018). "Grammys 2019 Nominees: The Complete List". Billboard. Eldridge Industries. Retrieved December 13, 2017.